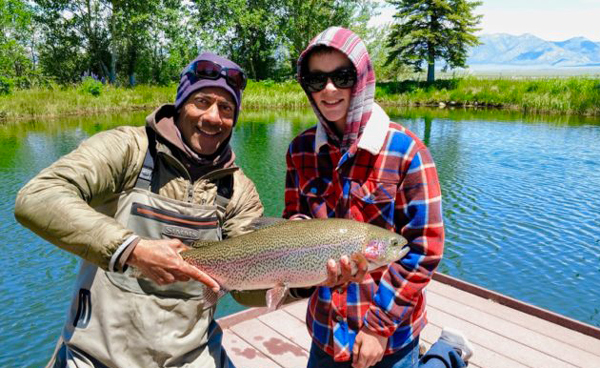 13 year old Tyler Solomon loves to fly fish! He scored some stellar rainbows! ***New for 2017! I have limited quantities of some new patterns that will guarantee advantage in your quest for trophy trout. Balanced patterns are the new rage for nymphing, & streamer fishing. We have been guide testing these patterns for several years, & I can honestly say they are the most significant improvement in fly design in over a decade. They are truly superior to conventional fly designs. The flies ride “parallel”; or “level” to the bottom giving them a far more realistic profile. The jig style hook becomes more effective as it seldom gets snagged on the bottom, & sets efficiently in the fishes mouth. These flies are intended to fish as your bottom fly in a multi fly; or tandem rig. They are deadly fished solo as a streamer. Add these patterns to your quiver for all fisheries that you still water nymph; or cast streamers. Some sizes are not available due to back orders on jig hooks, & are only available online at this time. I will add more sizes on some patterns as we get shipments in. Click on “fly sales” on the nav bar above, hit “menu” first from a mobile device to access the nav bar.